A world of practical uses. Imagine that you are sitting in the classroom. Your instructor tells you that you are going on a “virtual” field trip. She tells you to don the 3D glasses that are sitting in front of you. You don’t know exactly what to expect, but you’re pretty sure it’s going to be different. Experiential learning has been proven to be one of the best methods of teaching because most people learn best when they can have hands-on experiences with material. However, often times it is too difficult, expensive or dangerous to give a student a "hands-on" experience, especially when there is significant risk involved in the subject matter. The Cinemizer OLED takes education and training to an entirely new level! It allows educators to create "virtual experiences" for their students and enable them to experience things in the classroom that might otherwise be impossible. 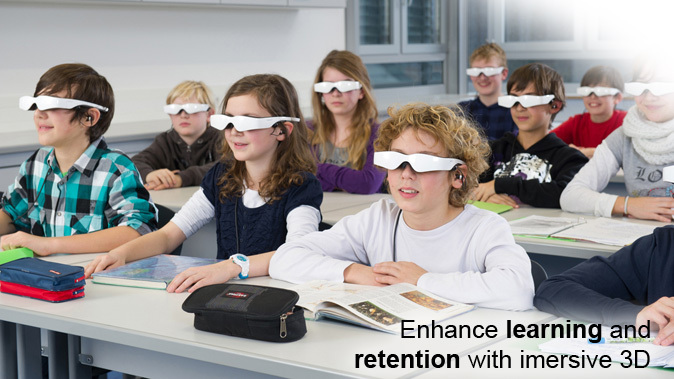 Utilizing the 3D video and immersion capability, the Cinemizer helps to keep the brain engaged and addresses most of the factors that inhibit high comprehension and retention of subject matter. Studies have concluded that 3D stereoscopic images are up to 8 times more memorable than two-dimensional images and has the potential to deliver learning experiences that students may remember for a lifetime! Thanks to the new Joideo App (meaning Join Video) a whole classroom of cinemizers can be controlled wirelessly by one device. A teacher or instrutor can launch, pause, scrub or start a new video on dozens of cinemizers simultaneously without any wires. 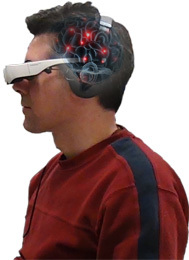 By using an iPod as the reciever and connection to the cinemizer, Viewers can simultaneously view an educational 2D or 3D video in the classroom and even ask the instructor a question through a simple virtual hand raise. Joideo is a FREE in the App store. 3D stereoscopic video maximizes sensory engagement and makes the learning experience more impactful and compelling. Immersion isolates the student from distractions and improves focus of attention. Learning scenarios can be downloaded, created or customized and connect with learners on a personal level keeping them focused and engaged. Total 3D Solutions can assist you with content as well as easy and convenient ways of using the Cinemizer in a classroom environment. Do you have an idea or application in the education and training field where the Cinemizer could improve the learning experience for students? Are you a school or training institution and are interested in more information about how the Cinemizer can be used to improve the quality of your classes? Are you an educator and are ready to purchase a Cinemizer, accessories and content package?